Here’s the second instalment of my brief Latin American food guide – this time L-Z. It has been a bit more challenging to come up with a food for every letter here and I allowed myself some liberty. I’ve enjoyed compiling the guide, I hope you enjoy reading. Lechón: It’s hard to beat roast pork, right? Ok, I know that this isn’t a strictly Latin American dish (from Spain originally) and it seems that the Philippines version is damn hard to beat. 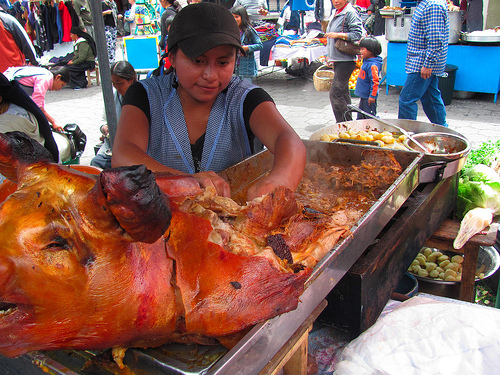 However in Otavalo, Ecuador (home of South America’s largest artisanal market) I had plate after plate of delicious lechón served up with corn for $2 a plate. It may not be lechón (suckling pig) in its strictest sense (the one pictured is pretty big!) but the flavour is still great. Pair with: Enjoy the pure flavour so simply have a glass of, agua por favor. 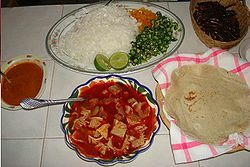 Menudo: Tripe (pancita) in a chile broth. Offal is not everyone’s cup of tea but in Mexico this is a market favourite. Throw in some lime, onion and cilantro – dip in your tortillas and enjoy! I must admit it’s not my favourite either but can be good for adventurous souls after a heavy night. Pair with: I think a limonada could be good with this to freshen up the palate. Nopal: The pad of the Nopal (cactus) is used in a range of Mexican dishes including guisados (stews), salads and tacos. A definite must-try when visiting Mexico. Watching the rapid and dexterous removal of the spines by a Mexican señora is fun too (see video below). Pair with: While you’re eating cactus you may as well drink it as well so I recommend a smoky mescal – distilled from the maguey plant. Ostras: Tough to come up with something distinctly Latin America here so I’ve gone with a memorable culinary experience; freshly shucked oysters with a squeeze of lime and a dish of chilli sauce on the Pacific coast beach of Sayulita in the Mexican state of Nayarit. Pair with: I’m not the biggest fan of Corona but it has its time and place. 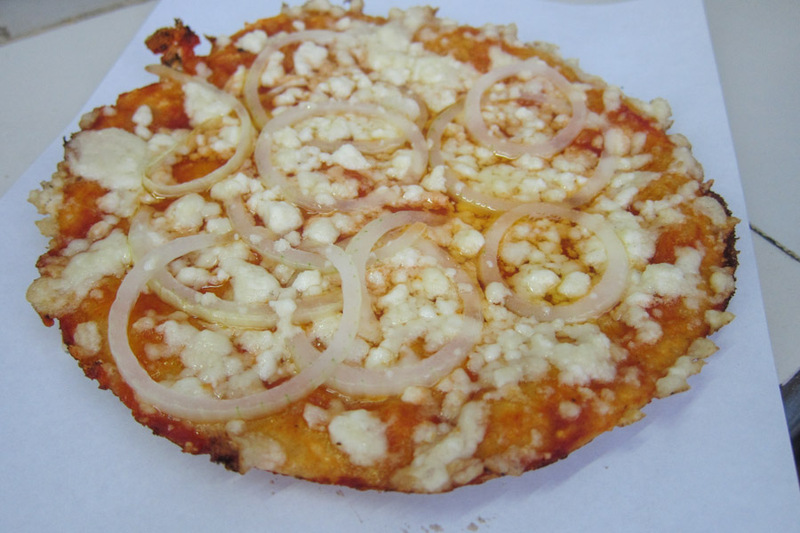 Peso Pizza: I could have gone for the Mexican stew pozole or the El Salvadorean pupusa but I’ll settle for the no-frills Cuban peso pizza. The first half of its nomenclature comes from the currency used to buy it – el peso cubano, not the more valuable CUC (convertible peso). Available all over Cuba from street side windows of businesses and family homes for just 5 pesos a pop ($0.25). The second half of the name, right you guessed it – but not as you’re used to. A flimsy, thick, doughy base, a thin spread of tomato paste and a smattering of cheese, maybe some onion- that’s it. Well, you can’t beat the price. Pair with: mojito! Something is needed to add pizzazz (could be the culinary grade of this pizza – zz) to this dour affair! Quesadilla: The blue corn variety are the best I’ve had. Find a busy spot on a Mexico City corner, choose your fillings (chicken and mushrooms, chorizo and squash blossom are personal favourites), watch it prepared before your eyes and bite into bliss. Pair with: Atole, for a double corn hit to make a hearty breakfast. 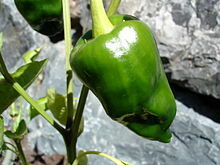 Rajas: Poblano pepper. If you buy a torta (Mexican sandwich) in Mexico you will usually be asked whether you want chipotle or rajas as the spiciness adding adornment to your torta. Usually an accompaniment, it can also be the feature of a dish such as in rajas con crema. Pair with: A jarritos soda. Mexicans LOVE their soft drinks to the point that the government has decided to add a one peso per litre tax in an attempt to combat a growing obesity epidemic. Still nothing goes as well with a torta with spicy rajas. 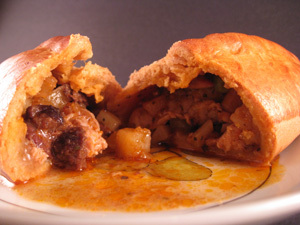 Salteña: This is basically a Bolivian version of an empanada. They can be filled with a variety of different meats and sometimes vegetables or egg. From my experience the pastry was softer and more crumbly than a Chilean or Argentine empanada and usually juicier. Part of the fun is tracking them down from the vendors roaming the streets, often elderly indigenous ladies. Pair with: Coca leaf energy drink. to help you track down those fast moving vendors! Tlayuda: The choice at this letter is rather extensive; tacos, tortas, tamales, tostadas. In Mexico they are collectively known as ‘vitamin T’: Essential to any diet. I have gone, however, for the lesser known tlayuda. 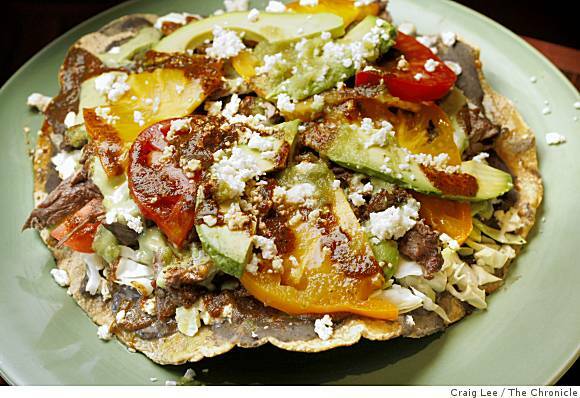 Originating from Oaxaca, a tlayuda is a large, crispy tortilla topped with beans, lettuce, avocado, your choice of meat, queso oaxaceño and of course salsa. Kind of a variation of a pizza. If you ever go to Oaxaca, get one from one of the various street stalls behind the city market – superb! Pair with: a hot chocolate – another specialty of Oaxaca. Uva: The humble grape. I’ve included this not so much for its value as a food but for what it can be turned into. 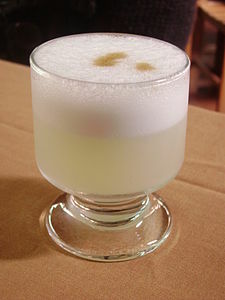 A velvety Argentine malbec, pisco to make that perfectly frothy pisco sour, a spicy Chilean shiraz. Pair with: A Peruvian Pisco Sour. Vanilla: Native to Mexico and cultivated by the Aztecs-, conquistador Hernan Cortes is credited with introducing vanilla to the wider world. Another great Mexican gift to the world. Pair with: Ice cream! Of course. Wiener: I have to draw a bit of a long bow here. Stay with me. 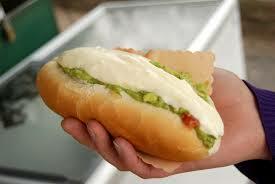 Hot dogs are extremely popular all through the Americas and there are numerous local varieties; the Chilean completo (pictured below) smothered with avocado and mayonaise, the Mexican version – wrapped in bacon or the Brazilian variety (corn, shoestring fries, mashed potato). I made it my business to try them all. Pair with: A local cerveza, o dos. Xoconostle: In Mexico there are many indigenous place names starting with x; Xochicalco and Xochimilco for example so I thought there would be a food starting with x as well and indeed there is. 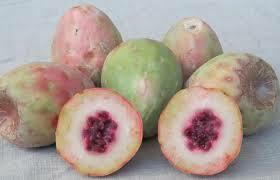 Xoconostle is the name of the sour prickly pear type fruit of the nopal cactus. Most commonly used to make salsas. Pair with: Another cactus food to be paired with another cactus derivative – tequila! Yuca: Also known as cassava and manioc this root vegetable is native to South America and shows up on plates across the region such as a Bolivian fish soup. Apparently the world’s third largest carbohydrate source. Pair with: The slurping of your flavoursome broth. Zapote: This fruit which comes in several varieties is native to Mexico, Central America and northern South America. The kind I am most familiar with and have tried is mamey. The flesh is an orange colour and kind of milky. I can’t say I loved it but it’s worth trying. Pair with: Good in milkshakes, apparently. Can’t wait to set off on a culinary adventure to sample all! You have wetted my taste buds….great article. Thanks mum, glad you enjoyed it.. you’re one of my very few readers. Excellent! Does the wiener completo come with a cardiologist? Wow. No cabe duda que en su listado de la L-Z Mexico se ve presente en todo momento pues gracias a su amplia variedad de ingredientes e historia todo platillo tipico ya sea de Oaxaca, Veracruz, Ciudad de Mexico, Nayarit, etc. nos permite conocer que en toda América es reconocida nuestra Gastronomia. Soy estudiante de Gastronomia y ver articulos como los que publica usted me hace sentir segura y orgullosa del camino que quiero tomar y que mejor conociendo nuevos lugares tanto de mi país como de otros a travez de sus sabores. México es una potencia gastronómica, por su variedad de diferentes alimentos, destacando los platillos mas representativos de este país, enriqueciendo la cultura gastronómica en latinoamerica, junto con argentina, Bolivia y brasil. El origen de estos platillos intervino la gastronomía europea dando como resultado una fusión deliciosa. Es increíble como nuestro país tiene muchas riquezas Gastronómicas de tal forma que admirada, conocer cada pueblo basado en la Gastronamia, es saber de historia, conocer cada cultura, disfrutar de olores y sabores es asombroso..
La mayoría de los platillos aquí mencionados, son consumidos e incluso originarios de México. Es satisfactorio contar con una amplia variedad gastronómica, que sea atractiva para los extranjeros, es un buena forma para dar a conocer el país. En lo particular he tenido la oportunidad de consumir algunos, sino es que la mayoría de los platillos aquí mencionados y podría decir que son agradables hasta para el paladar más exigente. Son platillos e ingredientes que por ser únicos en el mundo, nos hace lo que hoy como país somos aun que han pasado generaciones tras generaciones estos ingredientes están vivíos y no solo eso han traspasado muchos continentes para así ser mas requeridos y consumidos , que solamente pueden salir de México. Aun que en nuestro continente desde nuestro país asta chile es un mundo de tradiciones y platillos únicos. A través de los largos trayectos que ha realizado por todo el mundo descubre platillos y bebidas que son deliciosos pero que algunos son desconocidos por otros lugares ;es por ello que es un orgullo que haya personas como usted en donde expresen la gran variedad gastronomica que tenemos México. Sobre todo nos muestra que cada lugar es caracterizado por los platillos que posee y que los hace muy diferentes en el ámbito gastronómico porque cada platillo de diferente lugar contiene un olor y sabor que los distingue de los otros lugares del mundo.